I have a confession. Although my world is a UX-centric one, I added ‘service design’ to the meta tag of my website and have been using terms like ‘service blueprint’ and ‘swimlanes’ in meetings. I watched as a LinkedIn group changed its title three times from UX to UX / CX / product / strategy and the web site recently added service design to its description. The traditionally-focused MRA (Marketing Research Association) merged with another entity and changed their name to the Insights Association last year. Consolidation of these disciplines are happening real-time. At this point we do not know which discipline will lead the insights revolution — instead hyphens and lengthy titles are used to make sure no one is missing out. 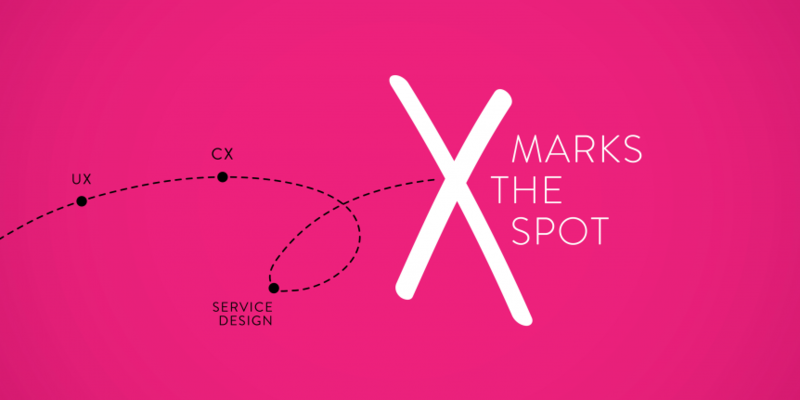 This article attempts to explain the differences and similarities between three very honored disciplines: User Experience, Customer Experience and Service Design. Although different from inception, they now combine processes, artifacts and outcomes. So bear with me as I describe, define, differentiate and then combine terms. Simply stated, I am committing professional blasphemy by integrating them under a catch-all term: Experience Design Thinking. No acronym applied. The term User Experience (UX) has evolved from the field of interface design and product development to represent an entire experiential ecosystem. As ‘digital’ continues to proliferate and redefine our society, the discipline of UX has climbed the corporate ladder into roles such as VP of Product, VP of User Experience and SVP of Experience Design — acknowledging the product experience as a primary business driver within many organizations. This has shifted the former overarching role of Customer Experience (CX) within the marketing umbrella to an even, albeit awkward, level — attempting to create cross-functional teams and integrated business silos. CX has been around for decades. It is focused on the ‘voice of the customer’ and the relationship a customer has with a brand, organization or business over time. Traditionally it covers multiple touch points including advertising through purchase, customer service interaction and overall satisfaction. CX merges traditional market research and business analytics to create a measurable customer-focused perspective. Large budgets are spent on market sizing to query potential customers, determining how they are broken down into demographic and behavioral segments, with the results being used to mitigate risk and determine a forward thinking business strategy. UX has been around since the inception of the web. Broadly, UX is an iterative practice of creating usable, useful and pleasurable products and services. Going granular for a moment — subsets of UX add design (UXD) or research (UX Research) both incorporate design thinking as part of an insights-driven process. This process allows teams to identify unmet needs and ideate to produce solutions that meet customer and business goals through ‘out of the box’ brainstorming, prototyping and testing solutions. The outcomes are tangible and feasible with a distinctly human-centered focus. Enter Service Design. Service Design is a discipline that maps a person’s experience through all aspects of their journey (the front stage) and all of the business processes (the backstage) as part of a comprehensive ecosystem. Its primary purpose is to understand how this ecosystem works by mapping the people, props and processes (Neilsen) within a logical structure. Service Design attempts to both improve and innovate on the experience. Service Design has its roots in hospitality, where the entire physical operation of a hotel is successful when all aspects are working together. Many of the deliverables are the same as UX or CX output. These artifacts (experience mapping / journey mapping / personas / etc.) serve a common goal. The way they are positioned and used within an organization is slightly different. Service Design is holistic and comprehensive, with solutions that are not always user interface-based. A true Service Design approach is disciplined, with up front research and creation of journey maps to outline the customer’s experience across time, while mapping their underlying needs and emotions through the process. The journey maps are then used to outline opportunities (different ways to solve problems or answer needs) in co-creation workshops where ‘actors’ (customers / end users) are brought into active working sessions to vett and brainstorm alongside business owners, researchers and designers. Storyboards or prototypes illustrate the future-state vision. Finally, through this process, a Service Blueprint is created as an action plan to outline vertical ‘swimlanes’ highlighting the front stage customer experience and back-stage business responsibilities (or pitfalls) simultaneously. This diagram shows the progression of Service Design through both UX and CX environments. As you can see, many of the terms overlap. UX tends to sit on the product and current spectrum of the XY axis. CX tends to be towards marketing and future growth. Service Design weaves through the entire diagram, capturing a whole experience from beginning to end. User Experience (UX) originated at the interaction level of product-design. It has since moved up the chain as the product has become the central component of many businesses. In many cases these days, the product is the company. Now that product experiences are part of a large ecosystem, we need to think on a broader scale across multiple touch points in the experience. Service Design started as an intangible goal related to an service-level experience. This could be booking a hotel to entering the lobby, touching the pillows and receiving a package during your stay. The service represents the entire experience which exemplifies itself as an overall goal. Now that most of these experiences have a digital component, the insights ecosystem is converging. Customer Experience (CX) emerged at the marketing level as companies targeted customer acquisition, retention and referral more effectively. It started as a discipline within marketing reflecting the customer’s ‘voice’ and needs, rather than a billboard campaign to direct behavior. Now that marketing has acknowledged it is the ‘Age of the Customer’, the strategies behind targeting and retention are now weighted on the customer’s whim. Grounded in product design and engineering, with usability and engineering / human factors embedded in the process. Research methods are based on anthropology and ethnography for human-focused insights. Grounded in hospitality / marketing with a focus on the experience and ecosystem meeting needs and innovating towards a better experience through improvement of business processes. Grounded in marketing and customer service, with customer service, C-level focus and buy-in based on measurable data used to focus business goals and mitigate risk. Much of the information is used to target advertising and marketing and aid in referral and retention through a good experience. How much data can I gather and understand to market more effectively to this target group and determine long-term budget and focus? 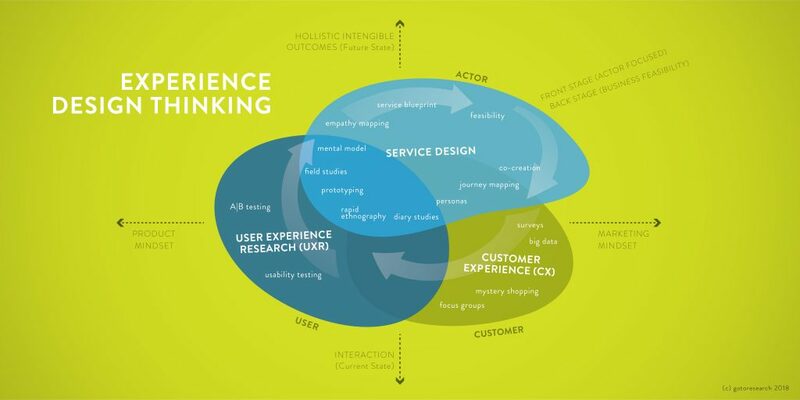 In the ‘day-in-the-life’ collection of behaviors, needs and experiences — Service Design and UX Research are similar. UX Research works in tandem with UX Design to iteratively test and refine solutions to continuously improve the experience. UX Research methods now go far beyond its background in human factors and usability. Both UX Research and Service Design methods integrate best practices in ethnography, field research, In-depth interviews (in-person and remote), and seek to get out into the real world. 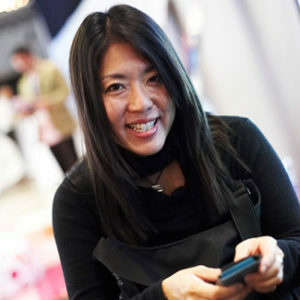 During the analysis and synthesis phases, the two disciplines both use behavioral segmentation, persona creation and of course the infamous journey map to highlight pain points and needs, and to use these insights in co-creation sessions as opportunities for refined processes or new concepts to emerge. The differences between these two disciplines are in the tactics for solving the needs identified. UX Research often feeds back in cycles into UX Design to offer immediate solutions — many of them interface-oriented. While several touch points are brought into play, the areas UX Design governs is generally in the design and implementation of a given product-level interaction from touch-level user experience to the development and technical-level implementation. These days however, UX Research often feeds into the future-state of a product, allowing the stories and journeys to illustrate opportunities for the product experience to expand into a larger ecosystem. So if X marks the spot in Experience Design Thinking, it is clear that the terminology and leadership also needs consolidation. Like a diet, whatever discipline or flavor selected within an organization needs to be embraced holistically rather than a journey map here, a persona there. I now look at generative research in a more disciplined manner, and will continue to tout a more focused and holistic approach towards tangible, implementable outcomes.